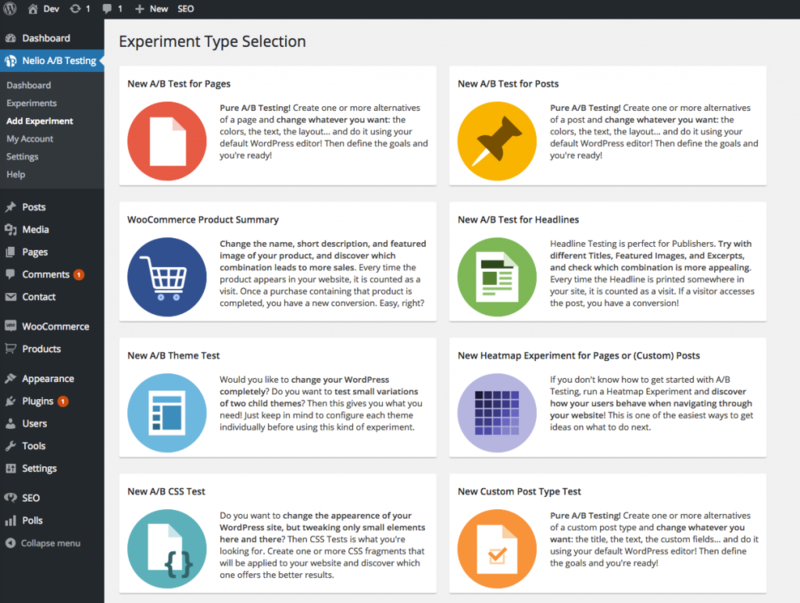 No other A/B Testing plugin in the market offers something like that! 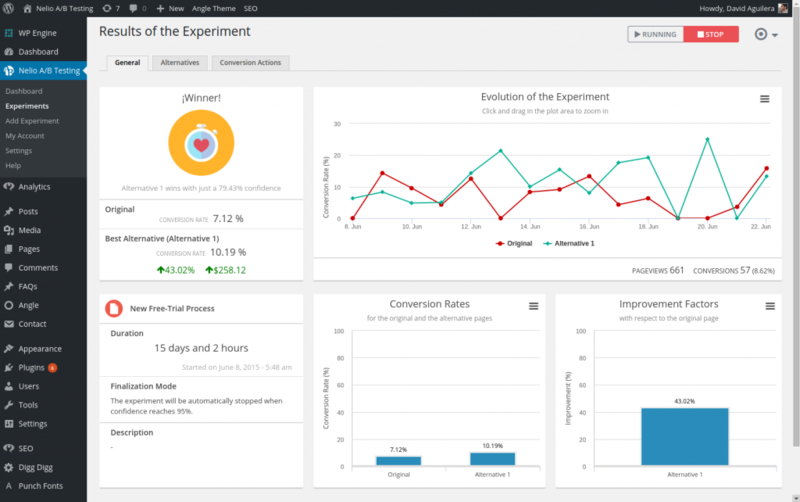 Nelio A/B Testing is the only solution that includes Widget Testing. Easily duplicate your current widget set, change it by adding new widgets, removing old widgets, and editing others, and discover which widget combination improves your conversion rate. Why is this important? On the one hand, Widget Testing will give you actual data to choose among different possible widgets (for instance, “should I use this widget for featured posts or the other one?”). On the other hand, if you’re using widgets to add affiliate links and advertisements in your site, Widget Testing will also give you useful insights and detailed information about the best widget arrangement to maximize your incomes.No other A/B Testing plugin in the market offers something like that! Once you have installed, activated, and configured your A/B Testing Plugin, adhere to the following directions to begin split testing! Under the Nelio AB Testing menu, click Experiments to view and manage your experiments. Please note that the first time you access this page, you will not see any experiments. If you have not yet defined any experiments, click the Create one now!link. Click the Add New button placed beside the title, Experiments, in the upper left hand corner. Under the Nelio AB Testing menu, click on the Add Experiment option. 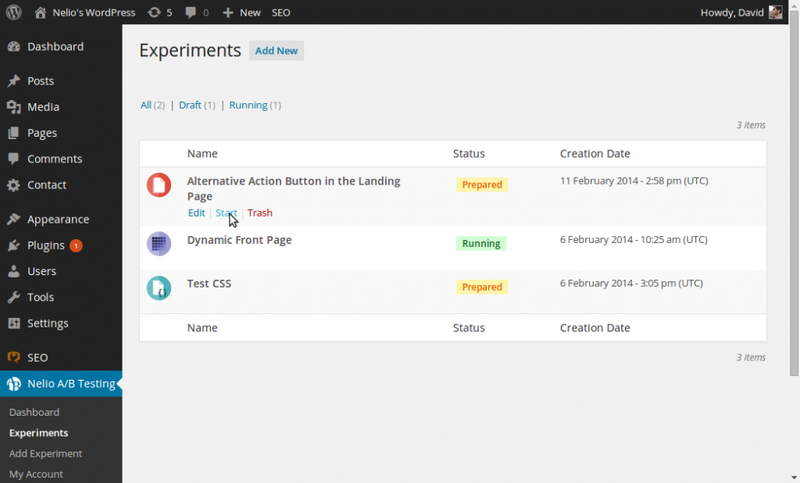 You will now see a list with all the possible kind of experiments you can create. For each of them, you’ll see its name, an icon, and a description. Name: a meaningful and descriptive name for the experiment that will help you identify it in the future. Description: any additional information about your experiment that will better help you identify it. Name the alternative widget set beside Name (e.g. “Place affiliate link in the left sidebar” or “Testing the New Related Posts Widget”). Click the Create button right below Name. You may create as many alternative widget sets as you want. By default, all alternatives are empty (they contain no widgets at all). Click on the Save Experiment and Edit Content link that appears below their names to add, remove, and rearrange widgets. Editing alternative widget sets is extremely easy. You’ll notice that the user interface Nelio uses is the regular user interface, with a few additional controls. You may add, remove, and rearrange widgets using drag and drop functionalities. The first time you edit an alternative widget set, it contains no widgets. In order to duplicate your current widget structure, simply click on the Duplicate Widgets button and you’ll get a copy of your current setup. Click on the New Action you want to create (for instance, if you want your users to view the Basic Package or the Professional Package page, add a new Page action). Configure the action properly (in our example, you’d have to select the select the Basic Package page, or the Professional Package, as well as any additional info required by the action*). Repeat the process for all the actions you need. * For more information about how goals work and the available actions, check our Conversion Actions and Goals page. Once you have defined the experiment completely (that is, you defined the basic information and added one ore more alternatives), you may start the experiment. In order to do so, just go to the Experiments page, hover over the experiment you want to start, and click on Start to launch it. * Experiments cannot be edited once they’re running. You may edit the contents of the alternatives, even though this is not recommended. Changing the definition of an experiment while it’s running may impact on the performance of each alternative and, thus, invalidate the statistic results obtained. Page Views: how many times have your visitors viewed your widgets (either the original set or one of its alternatives). Alternatives: number of alternatives defined in the experiment (original version included). Original Version’s Conversion Rate: conversion rate of the original version. Best Alternative’s Conversion Rate: among all the alternatives (original version excluded), it shows the highest conversion rate. 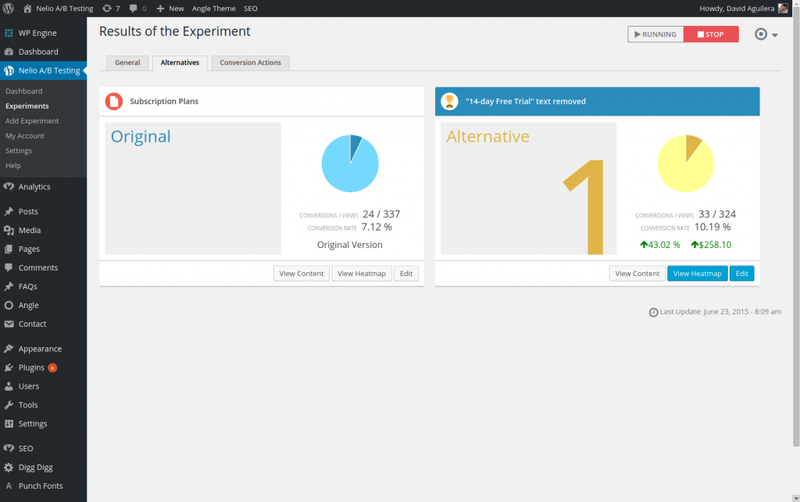 If you want to see more information about the Progress of the Experiment, either click on the experiment’s card in the Dashboard or go to the Experimentspage, hover over the experiment, and click View. 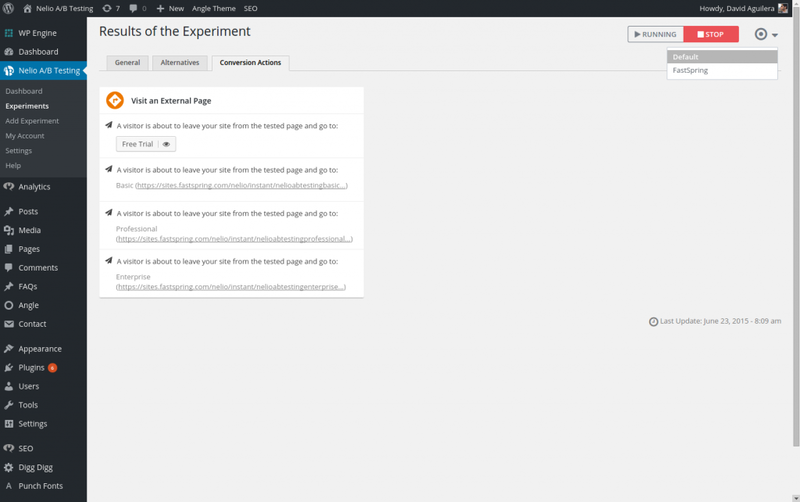 The Progress of the Experiment page is organized in three different tabs. Each tab focuses on a different aspect of the test and provides the most valuable and relevant information related to that aspect. Big Icon. The icon helps you identify the progress of the experiment quickly. If it’s red, then there’s either not enough data or none of the alternatives is better than the rest; if it’s yellow (with a clock on it), there’s a possible winner, but we’re not confident enough about the results; and if it’s blue (with a #1 badge on it), there’s a clear winner. Conversion Rate of the Original Version. How your current version of the tested element is performing. This gives you an idea of your current conversion rate. Best Alternative’s Conversion Rate. The percentage of times that visitors went to the designated goal page o post when shown the best alternative* (without including the original version). A Timeline of the conversion rate for the original and each alternative, as well as the total number of conversions and page views that the experiment has. Some metadata about your experiment. In particular, you can see the name and the description of the experiment, how long has it been running for, and the finalization mode (if any). Finally, you have two additional graphics showing the conversion rates of each alternatives and the improvements of each alternative with respect to the original version. * The best alternative is defined as the alternative that has the higher conversion rate. A Screenshot of the alternative (if available), so that you can see at a glance how it looks like. Information (both visual and textual) about the conversions, page views, and conversion rates of each alternative. View Content. Opens a preview of the selected alternative. View Heatmap. It allows you to view the heatmap and clickmap for the page that is being tested. Edit. It is shown when the experiment is running and allows you to modify the alternative. Apply. It replaces the Edit link when the experiment is finished. It allows you to override the original page with the contents of the winning alternative. The last tab contains information about the Conversion Actions of the selected goal. You can change the active goal using the Target icon located at the upper-right corner of the user interface, next to the Stop button. For each goal, you’ll see the list of all the conversion actions it contains. These conversion actions are organized depending on its type. 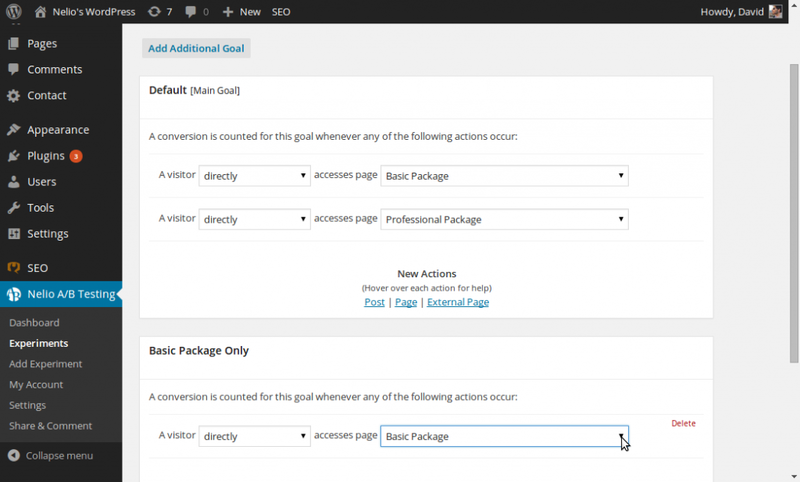 Take a look at our analytics page for more about about conversion actions and conversion goals. TAKE A LOOK AT OUR PLANS!